Celebrities hunt for antiques across the UK. Actor and charmer Nigel Havers and his canny ex-agent Michael Whitehall explore the West Country. Browse content similar to Nigel Havers and Michael Whitehall. Check below for episodes and series from the same categories and more! plus his old agent, who's a bit of a star in his own right. -So, what are we doing? -Do you not know any of this? No, because you tell me what to do and I just do it, generally. -It's Nigel Havers and Michael Whitehall. -Your negotiating skills aren't exactly legendary. is sharing a Bentley with Michael, his old Mr Ten Percent. -You've got what I haven't got. Which is that you're a supreme actor. "Supreme" - I like that, thank you. You never know when you're telling the truth. Some of your performances are breath-taking. Michael's also the father of comedian Jack Whitehall. They've even appeared together in their own TV show. He's already made a lot of jokes, of course, about antiques. "Have you two antiques gone off and bought these antiques yet?" and remain the closest of friends. so they should make for a formidable combination. I'm going to say, "I'm afraid, for me, that will have to be £400." -You maybe need to be a bit more ruthless with it. -I'm afraid I'm only going to give you £400! -Take it or leave it! How about that? -That's a bit over the top. auctioneer James Braxton and dealer Margie Cooper. I'm with Nigel Havers and you've got the very funny Michael Whitehall. -Are you going to be swooning? -I hope I don't come over all unnecessary. Do you? Margie, I don't want to get between you and Nigel. So, with £400 per couple, let's get cracking. We've just got married. This is why we're in this car. We took the ribbon off cos we thought it looked a bit flash. -Yes, and we're so happy. -Right, so are you ready for the fray? -What do we do now then? -We go and find the shop. Yeah, we're going to find a shop. Buy ourselves a little wedding present. -Such a shame to split you so early on. I wonder how Margie's coping with her charming chum. -I remember you from the massive Chariots Of Fire. "in these guys running around a track in 1924. "I wonder if we've made a mistake." And everyone said, "You've got to hang around in Hollywood. "You're very hot." I said, "I can't. "I've got to go back to tomorrow cos I'm doing an episode of Jackanory." Consummate pro. Wither the Bentley boys then? My boss, when I first became an actors' agent, he had a Bentley. And I made the most terrible mistake. you're stuck with him talking to you all the time. I think the Bentley's definitely looking like the wiser choice. Talk about chariots of fire! We've got smoke coming out of the back. Smoke's coming out of the back. They're right, you know. Better pull over. -I'm sure this doesn't happen on Nigel's usual productions. So, what would happen? Would it blow up? It could do if it got really, really hot. -Well, luckily, I don't think we're far. -Shall we leave it there? No-one's going to steal it. It's not going to go anywhere, is it? Right, let's go. Come on. before eventually arriving in London and an auction at Southgate. whose motto is "By virtue and industry". And I'm sure it has more than enough of both. Um, wait, hello, it's me. Yes. Just to let you know, our car blew up. We managed to get out before it exploded and we ran into a field. and now we're going to work. Bye-bye. Always call your agent, eh? Come on now, Nigel, break a leg. -Lots of extras on set today. Another orange man! Are you following me or what? there has to be something to suit our pair. So, basically, anyone who's got rubbish brings it here. and try and find stuff. This colander - someone's converted it into a lampshade. You put that in a very smart place, it would look amazing. That might be one of my extravagant and odd buys. I'd give him a couple of quid. -Maybe a fiver. Am I insane? -It's all up for grabs in here though. -There is a certain amount of age to it. -It doesn't look like much. -Yeah, is that going to be a problem? -Let's have a look from a distance. -It looks better from a distance! Lordy! What can Margie come up with? where they used to have furniture made with the shell back. -Yeah, little seats in the grotto. Is that a little weed growing out of the...? I'd like to keep that. -What are the chances, eh? -I do quite like that. and you have that as a waste paper basket. Nigel's definitely got a thing about those. -Time to get Steve involved, methinks. -We like the look of these. -Yeah, they're called screamer stools. -Really? Never heard of that! -It's cos of the face on them. -It's a big mouth there. -They're about £60 a go. -I am quite interested in that. I'm also interested in this little baby here. -It came from one of the demolition jobs that we've been to. -It's obviously been outside, hasn't it? Yes, but it's just a paint thing. -and I've noticed there's another one at the back. -Yes, it is a pair. you'd be able to go a bit lower if we bought the two. I'd come down to £100 for the two. Not so scary. Now for Nigel's bucket and some baskets too. You and your cockle bucket! -which has not been hacked about. -How much is the cockle bucket? If you got it at what it cost me, it was £15. -These two... Can you not ease it a bit more? We're just gambling, aren't we? We're in a London auction that we don't know, Stephen. -you'd get £80 each, easy. -Yeah, I wish I hadn't said that now. Ha-ha, quite, Margie. Time to have a bit of a team talk, I reckon. -We've thrown out the baskets. We've thrown the baskets out. I think we should go for the SCREAMERS! I could have another tap at him. -Have another tap and maybe the cockle bucket at £10. -Right, and if he says no, what are you going to do? -"OK, £500! Whatever you want!" -We've come to, um, I think, a wonderful conclusion. Which is that we'd like the SCREAMERS. I think they're fun. -And what if I said £110 for that lot? elsewhere in Bristol, in a car that still works. My first big client was Kenneth More. Reach For The Sky, Genevieve and all those films. who was the Attorney General, Lord Chancellor. "My boy is looking for a new agent. "The chap he's got at the moment is absolutely useless." And Kenny More said, "Darling, you must take him on. -and, as it turned out, he was a huge success. that should suit art lover Michael down to the ground. ..is probably like no other wigwam you've ever seen. -It's modelled on a Gloucestershire barn. as curator Mike Newstead can explain. and he was a Bristolian of German extraction. and they decided to call themselves the Bristol Savages. may have been an influence. with their somewhat eccentric methods already firmly in place. and paint to a subject set by Chairman for the evening. So the artists don't have an apple or a model? which might tickle his or their fancy. They have no prompts, they have to do it inside the studio. who turn up later to enjoy the fun, wear green. has had many talented artists amongst its closed ranks. but he learnt to paint by using the brush in his mouth. And that's a portrait of Captain Robert Falcon Scott. to buy a pony for his expedition. And there is one of the ice picks. -for when my son, Jack, misbehaves. came and painted with the artist members in the studio upstairs. -And in our archive, we have the very painting that he did. -Did he do a bird? Well, he was an ornithologist, I suppose. I'm sure he'd easily have won his red feather. I wonder what our two will create when put to the Savage test. -Do we have a title? -Yes, we do. I've written it on the board. is the original board that's been used since 1907. So much concentration going into that. That's stuck with me as the only thing I could do. Well, I think there's a new "ism" coming on here. You should phone the London galleries. but it is only the first audition. letting them down lightly, don't you? where Nigel and Margie have reached their next shop. -Jay, nice to meet you. -I just spied this, um, this top hat here. Do you mind if I..? Thank you. -I do like a top hat. I went to Ascot on Tuesday. It's sort of too big for me. Do you remember that comedian called Parrotface Davies? They may well have appeared together in panto. Well, we'll see if anyone salutes it, shall we? -There are a couple of moth holes in there. -It can be £15. Cheap. -What year do you think that is? -I would probably say '50s. -Shall we make it that? Just think, when you've just won Chariots Of Fire. Wouldn't you just love to run round, having achieved a gold medal? -they'd put this in the middle of the table like that. -Or a burial at sea! -£15. It's cheap as chips, that is. Have you got anything similar to go with it? Good plan. What can our Jay find? -Are those all for sale? -Yes, they're all for sale. There's a tin there with a view of something. -Oh, that's Fortnum & Mason. -That would go with it, the flag. -Could we get that tin down? -Yes, let's have a little look. -Do you want to squeeze past me? -Jay, this is what you do for a living. So, we want to have a look at this bottom one here. So, we've got that one there. Is that Tower of London? It's old London. -That's the Tower, isn't it? -That's where you went through if you were in big trouble. -Was it that one there you were looking at? Ah, Crawford & Sons. Delicious! Original ring on the top. -OK, these two tins appeal to me. -Do they appeal to you? -Job lot of tins - is that where we're going? -I was going to say I'd do the lot for £15. -It's a bit like an old-fashioned sweet shop, this. -While you're at it, I'll have a KitKat. -Macfarlane Lang. I remember them. -I think she's great. We're having her. -Any danger of a deal, do we think? -Yeah, and these are £15. So, can we lump it all together? -The word "Lump" is what I like. -It's £30 for the two lots. That's cheap. They're certainly buying in bulk. Right, let's try and get out of this hole. But how does Margie reckon it's going? I think we're buying some really funny and interesting things. -I'm not sure about his cockle bucket. But he's a very attractive man. And he's lovely as well. He's lovely with it. So, yeah, enjoying it immensely. Margie, what do you think of this? Say what you like about our Nige, he certainly puts a shift in. things are up, up... Oh, there's an aeroplane up there. Lots of things remind me of my childhood here. Lots and lots of things, including this sledge. Look at this! This is great! That's a two-seater. I loved to go sledging. It was fantastic. Of course, it used to snow a lot more in those days. I'm quite interested in that. our other pairing have still to part with as much as a penny. Michael, are you a collector? I have sort of crazes of collecting things. -and I ended up with far too many pictures. -Are you a tough negotiator? -I am a tough negotiator. My problem is that I do have slightly weird taste. very often doesn't appeal to anyone else. biscuit tins or model planes, cos they've all gone. Going to be a lot of money, isn't it? So, it has flown? -That would have flown at some point, yeah. -How do you land it? -I just know how to stick it up there. -I knew it would be. £150? Just to get it out of the way. Yeah, actually, it sort of already is. -Well, if you're interested, ask for the best price. -What's the best price for that, please? -That WAS the best price. -Perhaps the sledge will go down better. Whoops! Don't worry about that. Look at that. -The runners are still there. -See? Any brakes on it? No! -There don't seem to be. -I had one with brakes on. -Yeah, yeah. What's the best price on that, Jay? It's £35 priced up, isn't it? A nice gentleman like you, it's £30. -I don't think that's going to be a goer for £30. -I was thinking 20 quid. I could split the difference with you there. £25. Don't look at ME. You found it! -In this together, eh, Margie? Hang on, there's more. Look, Coronation souvenir book, 1937. -Oh, that's lovely, to go with your flag. -Jay wanted £5, but I got it for £3. -There, is that the Koh-i-noor diamond? -That must be so heavy on her head. -That's why she's like this. a book and a sledge - all cunningly concealed from our late arrivals. This isn't a bus shelter, you know. That's out there, the bus shelter. -We're waiting for our limousine to take us home. I thought it was the 175C. We'd better do some shopping. -Good luck. I hope it isn't cancelled, OK.
Time to see Michael in action. Here's the proprietor, Jay. Michael. -How do you do, Jay? Bit late, perhaps, but definitely spoilt for choice. Michael, take that in your hands. When you hold something like that, what happens? Initial nerves? -Can I get a tune out of it? -It reminds me of my friend Elton John. -He has a quite elderly tambourine player in his group. He's had him for 30, 40 years, right back to the old days. -But he is really very old. He's even older than me. -Your oomph. Or your smack, is it? -My son is a comedian, as you know. ..at the end, just to let the audience know that the joke's there. So, for example, you'd say, "I sent my wife to the West Indies." -No, she went of her own accord! Keep smiling, Jay. They are getting there. What does this owe you, Jay? -Think of the amount of fun you get out of that. When somebody's still smiling, they're not upset, are they? -That'll have to go back on the shelf. -That can't be a fiver. -Careful, James, you'll wear it out. -How long have you had that up there? -Ten days and nobody's bought it! Are you beginning to feel nervous about that price? You've just got to wait for the right punter. That's what you've got to wait for - the right man to come in for it. -because I know you like it and I like it. -I would be prepared to go to £8. -Best I'd do is £12. -Well done, well done. Voila. -What a nice young man. I think that I should take a percentage of what your things make. -Obviously, that would have VAT on it. Ah, good to see the TVR's back on song. Let's hope it lasts. We bought, as Michael said, a bit of nonsense. I heard him say that he reckoned he was the oldest thing in the shop. -that she completely and utterly doesn't understand. It's made of metal and it's got holes in it. -That's all I can tell you. What about James? How was he? cos he'd make a lovely chauffeur. with just £9 spent on their tambourine, man. £9 or "Nein", we go! Leaving them with an awful lot to buy and almost £400 to do it with. But they still have well over £200 left for today's purchases. Hang on - looks like we're about to go off-road. Thank God this Bentley's four-wheel drive, that's all I can say. -in a muddy track in pouring rain. He's obviously not watched for a while then. but their next stop is in Somerset at Frome. I think it might be brightening up, you know. -It is a lovely day. -Are you going to go? -I think we should go. -Do you want me to? -I'd love you to have a go. -There could be a job in it for me later. I might be able to see my way to something for you. Ah, still running smoothly, I see. Almost as smooth as Nigel. Do you quite like playing, you know, the bad guy? -The bad guys are much easier to play. And they're a bit more fun. -Do people come up to you afterwards and tell you off? and people would say, "You owe Audrey 40 grand, you nasty man!" We all love a banter. Michael, I was very impressed with your haggling skills. sort of haggling for actors, you know. What is the tip? Were you a king of the pause or silence? I did the silence quite a lot. "But what happens if they offer it to somebody else?" I'd say, "Well, that is always the chance you have to take." up some of its steepest streets, called the Cobble Wobble. -Nice to meet you. I'm Sophie. -Hello, very good to see you. -What a lovely stock, isn't it? Spoken like men with exactly £391 between them. Anything Sophie would especially like to big up? -This is the lovely bronze. -That's very good, isn't it? -Nice sort of weight to it? It's all there. A lot of tapping. -It's always good to tap and ring. but I still think it's got a lot of quality. What have you got on this, Sophie? The bronze is £6,000 at the moment. -Right, well, we've got an idea of pricing structure now. Mmm, maybe something a bit more modest. So, we've got a very terribly smart biscuit box here. -This is by Huntley & Palmers, based on sort of Wedgwood. And priced at a mere £5. You can't all buy biscuit tins! Look again. Sweet little enamels, aren't they? Ballooning. People are quite potty about ballooning, aren't they? Bristol's a great centre of ballooning. They have a big ballooning festival. I rather like that. -How much is that, Sophie? Well, that's a start, Sophie, well done. I think we're going to think about that. There are plenty of pictures in here too. But what will tempt our boys? you want something that actually has a bit of craft about it. -This has actually been painted, this one. -Er, Don Quixote, isn't it? -Don Quixote, yes, it is, isn't it? so it's a sort of tin-glazed earthenware of Spain. Probably a holiday purchase, would you think, from somewhere? because he could have bought something six inches, couldn't he? -And he said, "No, darling, we'll go for the 12." -Yeah, but you know what they say about size. Don Quixote. I always forget this fellow. -I think he was called Sancho Panza - is that right? -So he was like a sort of... He was his man, wasn't he? -..that would be me and that would be you. Yeah, Braxton on the mule. If I may give that to you, sir. There you are. -And I think this was the other thing. -That was the other thing. -£20, I think it was. now how would you approach the whole thing? -provided I could take that with me too. I mean, I don't like to be ruthless this early in the day. I think he DOES, you know. -I couldn't squeeze you up a little bit? -Well, I'm only the chauffeur. Thank you very much, it's very nice to meet you. -He has his uses though, like lugging the lolly. We'll call that £17 for the charger and just £3 for the beaker. on the road to one of Nigel's favourite cities - beautiful Bath. -Nigel, do you know Bath well? -I do, I know Bath very well. -and I do think it's a magical city. -Oh, look at the view there. as a fashionable spa resort. from historian Dr Amy Frost. -I'm standing outside my favourite theatre in England. so this is where he spent a lot of his time. I imagine, was Beau a sort of nickname? as he began to sort of brand himself quite early in his life. -Putting Bath on the map. to kind of build up the reputation of the place. as the men who made the city a must-visit destination. So, Amy, what did they do for fun? Well, I mean, you told people you were here to take the waters. -That was the sort of polite explanation. But, of course, people would go shopping. Bath became THE place for luxury goods. but it was all entirely built on pleasure. -This is where he lived originally. -and then says, "It's time to go to the baths"? by nine o'clock in the morning. of orchestrating what they did for the rest of the day. -Yeah, yeah, he called himself the King of Bath. -So wherever he went, everyone would follow. -Shall we go and do a simple tour? after Queen Anne took a dip in 1703. -Yeah, you can feel the heat. But bathing was just the beginning of Nash's very strict social whirl. that they would take place in. and they're rules to be observed when in Bath. "in a ball because they are beyond or not yet come to perfection." Ladies are not allowed to be seen wearing a white apron. Duelling and carrying a sword around town was frowned upon. -And did people abide by these rules? to an awful lot of gambling. he is being paid a percentage of what people are taking. -Cos you can't really guarantee to make money out of gambling. -Of what the house makes. -And the house always wins. the King of Bath reigned as the city's MC for over 50 years. Would they have food all day or was it...? -other than chairs around the outside. to see who'd arrived in the city and did you know them. saying hello to people, gossiping with people. -So, you just sort of circulate. still doing its original function. It's a place where people come almost entirely for pleasure. he's still honoured with a statue. So, looking back on Nash's life, we have to respect him, don't we? Well done, old Nash - even though you are an ugly old bugger. how do you think my chauffeuring probation's going? would be an early note I would give you. I like the name. James is a very good name. Or Braxton is a good name. In fact, I'd slightly veer to the surname. You'd have to sort of smarten up a bit. -It's a proper antique shop, this one. -I'm Michael. How do you do? Michael, hat off, please. Umbrella down. -That is very nice, isn't it? That reminds me of Alfred Wallis's paintings. -Do you know Alfred Wallis? -He was a very elderly man. -and now his paintings are worth millions of pounds. Do you think he might have worked in a different medium? -He might have done. It looks a little too sophisticated. But I like it and I like the look of it. It's very decorative. -£75. That's not outrageous, is it? Sorely tempted. Back in Bath, Nigel's saying it with flowers. -So, this is going to go into the cockle bucket. -To liven it all up? -To liven it all up. -How much have you spent though? -Yeah. I really hope it brings you luck. -You've always had a thing about that cockle bucket. you've still got one last shop to look forward to. Yes, and with almost £200 left, they could have some fun in here. This is an incredible thing! I didn't expect them to have that. -I do like it but I've just seen the swing ticket. -£220, but it's a really good one. Hey, here's a tin-plate reminder of Bath's past. Nice and substantial, isn't it? Shopkeeper Alex should be able to extol its virtues. -Even the wheel rims are of steel. -It's got brake pads too. -Got brake pads, it's all there. There's a bit of age to it. What do you think? 50 years? -I'd say not much more than 50. -I do like it but I've just seen the ticket. -I look at you immediately. -The door is right behind you. -Something in the region of £70. -but can I just go away and...? A little coach in Bath and that primitive boat in Devizes. Anything else in this old house? -Sort of goes on forever. -It's a bit like the Eiffel Tower here, isn't it? -Very Dickensian feel to it. This was the children's nursery area, do you think? I think it was, yeah. -That's sort of Chinesey, isn't it? -..that shelf there, isn't it? -The door doesn't close now. There we are. Bit worried you're going to demolish it before we've even bought it. You can see I'm a natural for the self-assembly, can't you? A natural something, certainly! John, the proprietor, is on his way. -Ah, I'm glad you've come up. James is about to demolish this very elegant little cupboard of yours. -Is that the shelf for it, John? Why didn't you ask him in the first place? I think that's very pretty. -Do you? It's obviously very well-made, isn't it? -And has it got any age to it? -It's more a decorative piece. That's what they're about in North London, aren't they? -Yeah. And is there a price on it? -Um, I think probably £95. -Time to devise a deal. then we've got this after Chinese dynasty. What's the best, John, you could do for those two pieces? -We got buy one get one free in the last shop, didn't we? -That's not caught on round these parts. I was thinking £110, weren't you, for the two? -I could do the two for £150. This is the moment where I remain silent, Michael. What about £130 for the two? I couldn't possibly, it would break my heart. -So, what is your final price then? £145 for the two items. -For the two items carried downstairs. -Do you think so, Michael? Are you sure? But elsewhere, there's still work to be done. Now, that's familiar. -There you go. Yeah, yeah. Oh, yeah. So you'll be pleased about the one you picked up yesterday then! -And they were probably once in a little stand at one time. £85. -Yeah, they're very nice. A lovely pair! -Can we just put those down here? -Nice little stoppers on them. -Let's sort of suggest maybe £65. and those decanters under consideration. Anything else? -It's a nice big carboy, yeah. Oh, gosh, I don't know. We're in a right old pickle now, aren't we? -I could do that for £25. Let's bring it out. So that's £20 for that. £25, I think he said. -I'm just going to get the carriage. -Still in character, I see. -Getting the carriage, I'm on my way. -And this is our dilemma. -50 years old, roughly, but very decorative. that will probably be more saleable than that. -So, let's take those out of the equation. So, how much was this in the end? -You said we had to come up a bit in price. -We've got to get £100 to make a profit. -How about £100 for the two? -Yeah, £100 for the two? -OK, £100 for the two. Yes, but they're almost as excited by what they DIDN'T buy. -What about that tin caddy, that tin...? -£75! We had how many? -We got seven for £15. -Is that good for us? -It's got to be good for us. it's time to take a peek at what our teams have bought. -Shall we show them the spring of our jive? -That's a very nice collection. -You could have furnished a bedsit with this, couldn't you? -I think you've done really well. -A beaker, a small beaker. -I've had it retuned, listen. -Yes, it's quite old, isn't it? It's got what's known as a bit of age to it. And your little oriental cabinet there, quite sweet. -That was our most expensive item, wasn't it? -It wasn't an easy guy, that one. -I think it's absolutely charming. I like the little boat, too, I have to say. -The boat is very you, I thought. -Not bad for a steamer, single funnel, is it? -I agree. A little round of applause for that. Curtain up. Time for Act II. -We just take this off like this. -You could furnish a garden centre with that! -Quite a lot going on here. I love that sort of carriage, the stagecoach. What a lovely model! -Tell them about the chairs there. Well, those stone chairs, to me, are called sort of grotto chairs. -They are grotto chairs, aren't they? But the guy came up with a funny name. There's a man on the front going like that. There's a pair. -Just the weather for it. -We thought that was it. -But it's rare to get a tandem sledge, ie, a double. -You can get two people on that sledge. -That's very friendly, isn't it? Moving over here, if you may. Of course, it's the Queen's birthday. We have this collection of tins and goodies. A particularly good tin there. -And a coronation souvenir book of 1937. Well, I think we've all done really well. -We've all done very well. -May the best couple win. Now for some backstage backstabbing. "I don't believe you bought all that junk!" So, when I said, "That was brilliant," he was taken aback. did they? I mean, some sort of bric-a-brac place. If you were being unkind, what would you say? -but people love things in glass cases. -I think their saving grace is their seats. I love their seats. -A pair is always very good. -I always like a pair. at the London suburb of Southgate. Regrets? Well, one or two. I probably wouldn't do it in June or July. -And in a completely flat town. Not a hill to be seen. Come on, Nigel! Improbable sporting triumph? Heroes and villains? Just like the movies! -I'm a little nervous, but we'll be fine. -Don't worry, it'll be fine. while Michael and James have parted with just £174, also for five lots. I wonder what auctioneer Andrew Jackson makes of their spoils. The tin-plate coach, I like that. Arguably the best item. It seems to be, er...homemade, as it were. It's a very elaborate tambourine, I'm bound to say. You could use it. I've tried it myself and it seems all right. I'm not keen on the little boat, I'm afraid. Very rustic, naive sort of thing. It's barely O level, is it? Eh? O levels? Are we sitting comfortably? -So exciting. Ooh, here we are. with Michael and James's most modest purchase. Nice little beaker. Start me at £25 here. -It hasn't got a bid yet. 10? Start me off at 10. Come on. Nice little thing. £10? I don't think we've caught anything yet. Thank you, sir. 5 I'm bid. 8, if you like. At £5 in front. 8 anywhere? I think it's captured the imagination, hasn't it? -A £2 profit is not to be sniffed at. No, quite a handsome return really. -Any profit is good profit. good luck to you, is all I can say. and the auctioneer's favourite too. Thank you, sir. 85 I'm bid. 90 anywhere? Last time then. Well done! That was YOUR choice. It's not quite a chariot, but certainly on fire. -Wow, that was your choice. -Did they get the wrong lot number or something? with this Don Quixote charger, I wonder? -to a sale there but we just didn't have the time. -Start me off at 20. I like the way there's quite a pause. 20 I'm bid. 25 anywhere? 20 I'm bid. Last time then. -£20, my word, you two! You're a success story. -All done now? Thank you, sir. -Known as a maiden bid. -A maiden bid, well done. And a £3 profit is still a profit - just! Now, who can hear vague traces of skipping reels of rhyme? Tambourine with black japanned and gilded walls. -Thank you, sir. On the internet. 30. -Mick Jagger's here, you see. Mick's on the phone. -30 in the room. 5 now? -I knew there would be music lovers here. -Are we all done then? At 30. -We've not lost a penny yet. -It's very good, isn't it? We should almost take this up professionally! -I think both of you two should. if you'd like me to have a word. Have a word - that's very kind. Time to go back to Nigel's childhood, his rosebud moment. of sledging in this area. -are in the mood for sledging. lovely condition. 20, start me off. £20? You'll be sorry you didn't buy it in December. Jolly good. 15, sir? 10 bid. You'll make a profit if you can hang onto it for a couple of months. -Are all done then at 10? Well, it seems some lucky sledger's got quite a bargain. The cockle bucket is next. Don't forget the flowers and the one green bottle. to now, is a big step forward really, isn't it? It makes me feel a little insecure. -Together with Continental green glass globe. -Oh, God, we're going down. 20? £20. Start me off with £20. -You need a maiden bid now. -15 - the bid is going down. -He's not mentioned the glass. -There's a green bottle with it. -There's a bottle with it. 15 bid. 20 anywhere? 20. -They're doing quite well. £20. -There's a bottle with it! Sometimes, gilding the lily doesn't pay. But I think James was right about those dealers from Morecambe. If they'd been here that would have flown off the shelves. Something else with a salty tang - Michael's possible masterpiece. 15 then. I'll take 15 here. You're better off with a cockle bucket! What comes...? I say, what comes before 10? I suppose it's 5, isn't it? Ah, 5 I'm bid. Thank you, sir. 10 now? Are we all done then at £5? Well, we are quite a long way from the seaside. Ah, it looks like time for another of Nigel's collections. that we bought with our biscuit tins. I think he's probably gone for a wee. -People were quite disinterested around it. -Then I said, "Look." And they went, "Huh?" without going to the lavatory, and now it's all changed. I was rearranging my tins! 60 anywhere? No fivers here, eh? At 55 I'm bid. Anywhere at 60, ladies and gents? Whatever he did, it seems to have worked. and then you come back and then somebody shouts, "55". Ventriloquism has always been something you wanted to do. if they avoid a scary loss, they could well pip their rivals. Had you ever seen one of those chairs then before? I'm surprised you didn't get that in the catalogue. 40? Start me off at £40. 20 at the back. Thank you, sir. Here we go. 20 bid. Is there 25 anywhere? 25, sir? -This is better. You've got a bidding war. -30 on the right now. -What you're getting for 30 quid! All done now? Nothing on the internet, no? That's bound to encourage the others. I don't know what to say about that except I'm deeply disappointed. Finally, that cabinet, which somehow survived James's attention. There are people with a lot of taste here. -It'll add enormous tone to any home. -I may even bid something. -Go on, just throw that voice. 40? 30 then? £30? Got to be worth 30, surely. Nice little bookcase. 30 bid. -There you go. You've started. 30 I'm bid. 35 now? -All done then at 40.
but it's certainly a close thing. -I was never very good at maths at school. -I mean, I'm not great. but otherwise I'm not that brilliant. But I have a feeling that we might have just clinched it. -I thought you charged 12.5. -That was a special rate. made a loss of £114. So, they finished up with £286. made a slightly smaller loss, after costs, of £92. So, with £308 left, they are today's top team. it would all have been so different for you. Now, what was Nigel saying about playing the cad? -I just think it's rather me. -I think it suits you, son. Actor and charmer Nigel Havers and his canny, deal-making chum (and ex-agent) Michael Whitehall explore the West Country. 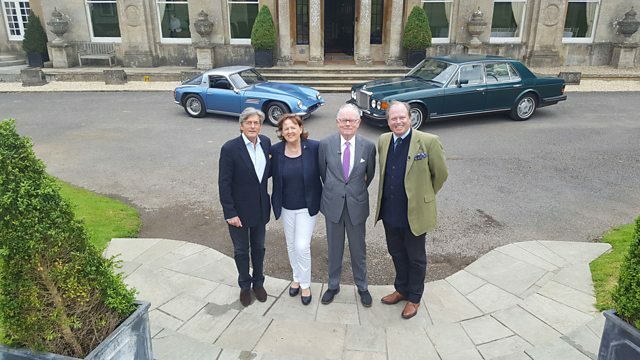 Travelling by Bentley and TVR, they have £400 each and expert advice from Margie Cooper and James Braxton. But what will do best at the auction - Nigel's old cockle bucket or Michael's tambourine? And there is a trip to see some Bristol Savages and bit of Georgian elegance with the story of The King of Bath.